India Inc's hiring activity, which has been on the path of revival, slowed down a bit in August and dropped 3.6 per cent as compared to the previous month, a report by job portal Naukri.com said. Naukri.com's monthly Job Speak index declined to 701 in August as compared to 727 in July, recording a drop of 3.6 per cent. However, the three-month moving average index indicates a positive trend and has inched up by 1.7 per cent to 715 in August from 703 in July. 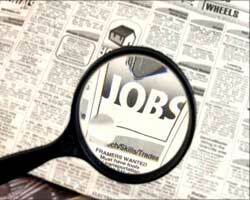 "Hiring activity is steadily picking up across sectors, including Insurance, Banking and IT among others. However, the market seems to be testing waters before consolidating its stance on hiring," Naukri.com owner Info Edge national head -- marketing and communications Sumeet Singh said. The reviewed month saw varied trends across cities with hiring activity moving up in four of the 13 cities tracked. Delhi-NCR saw slackening in hiring activities, with city's job index declining four per cent in August compared to July, the survey revealed. As per the three-month moving average, DelhiNCR seems to have recovered the most with its average picking up since May. Four cities, including Bangalore and Ahmedabad, saw a slight improvement in the index in August. Sector wise, except Banking and Insurance, there was a secular downward trend in hiring activity across industries and experience levels. Recruitment activity in Mumbai and Kolkata remained stable with the index declining by less than a per cent, while Chennai, Hyderabad and Pune saw a drop in hiring with their city job indices dropping by six per cent, seven per cent and five per cent, respectively. In the sector-wise survey, Banking & Financial Services and Insurance saw an increase in the sector index by 11 per cent and 23 per cent, respectively. Recruitment in the education industry increased with the index going up by nine per cent. The IT industry saw a slowdown in hiring, with the index declining by three per cent in IT-Software, six per cent in IT-Hardware & Networking and seven per cent in ITeS and BPO segments. The Construction and Engineering sector saw a drop of 7 per cent in hiring activity and telecom was down seven per cent in August as compared to July. Indicators reveal signs of recovery in Banking and Financial Services with its three month moving average moving to its all time high since December. The index has been calculated on the basis of job listings added to the website month on month with July 2008 as the base month with a score of 1,000 and the subsequent monthly index is compared with data for July 2008. The data have been sourced from Naukri.com and reflects job listings and, therefore, hiring trends on the site.